Memento: Georg Pelz with a photo of the first car he sold, a 1971 Opel Rekord C Caravan. 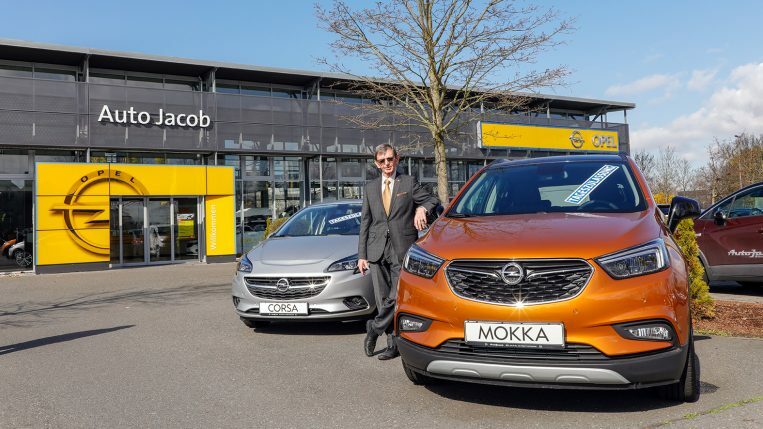 He is a regular fixture at Opel: Georg Pelz has been a sales consultant at Auto Jacob for 42 years. 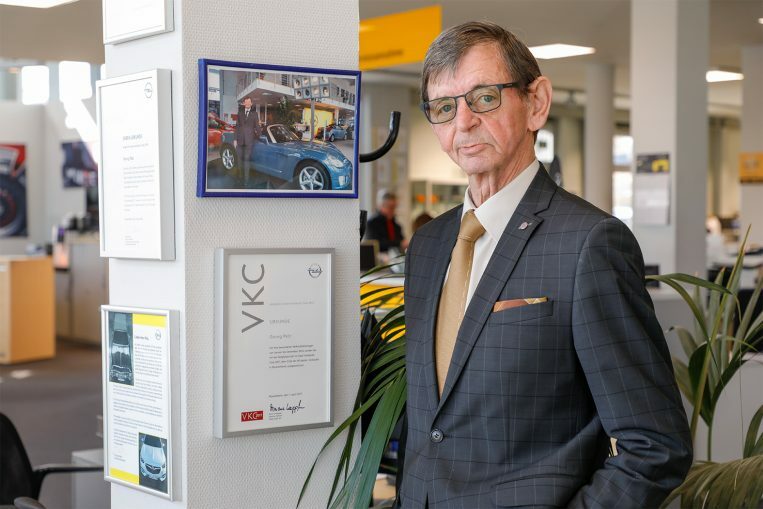 We met the 77-year-old at the Rüsselsheim dealership to talk about the past, the future and the secret of his success. Festgehalten: Georg Pelz mit einem Foto, das seinen ersten verkauften Opel zeigt – einen Rekord C Caravan Baujahr 1971. The Opel dealer network in Germany is marked by long-standing tradition and loyalty. Opel Post introduces long-term, notable dealerships through the ‘Opel for ever’ series. They say that the car business will change more in the next five years than in the last 50. If that is so, Opel sales consultant, Georg Pelz may well become one of the few to have experienced the whole transformation “live” from his workplace. Seventy-seven-year-old Pelz has worked in the car industry for more than 50 years, 42 of them as a salesman at Auto Jacob in Opel’s hometown, Rüsselsheim. His desk at the Opel dealership is strewn with paper work (“So much bureaucracy these days”), an open pack of strong cigarettes (from the German brand famous for its cartoon adverts featuring an angry little man) and an Oscar-like figure for “bester Opa der Welt” (the best grandpa in the world). 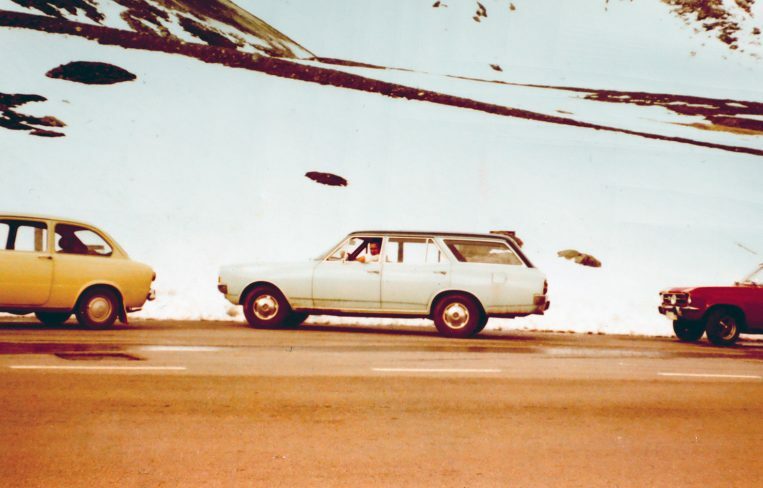 First of many: this Opel Rekord C Caravan was the first car ever sold by Georg Pelz. In the meantime, he estimates that he has sold more than 25,000 cars in his long career. 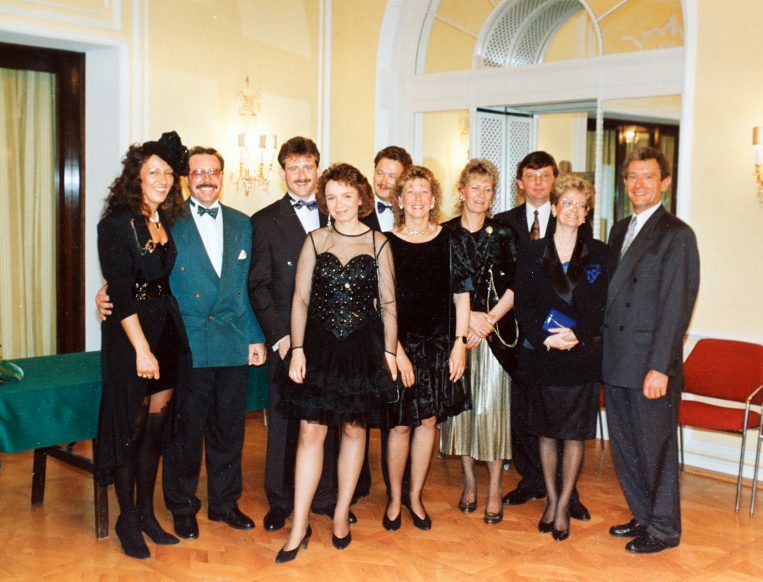 Dressed for success: Georg Pelz and his wife, Renate (third and fourth from right) with the team from Auto Jacob at the ball for Opel’s top sales consultants in Baden-Baden, 1996. He grew up with his brothers and sister on their parents’ farm, where he sharpened his talents by selling not cars, but fruit and vegetables. After the business was taken over by his elder brother, Pelz worked for a few years on the Opel assembly line in Rüsselsheim. His career as car salesman followed a tour of duty in the German army. 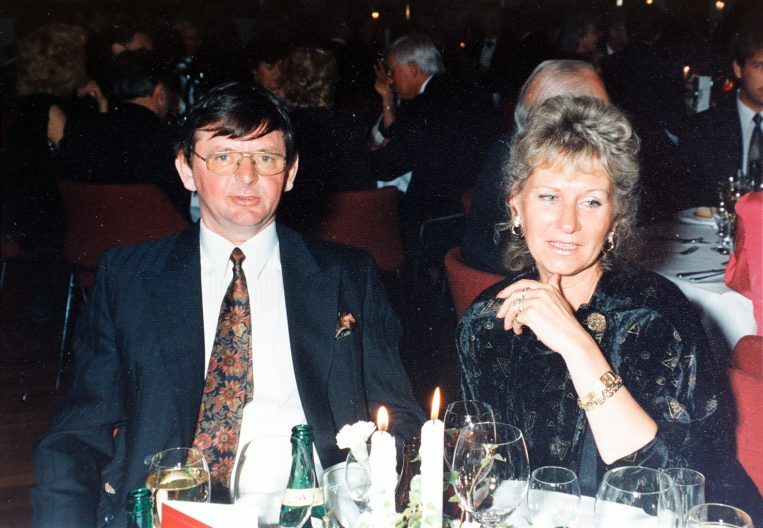 “At home you need a strong wife, who can watch your back”: Georg Pelz talking about his wife, Renate. 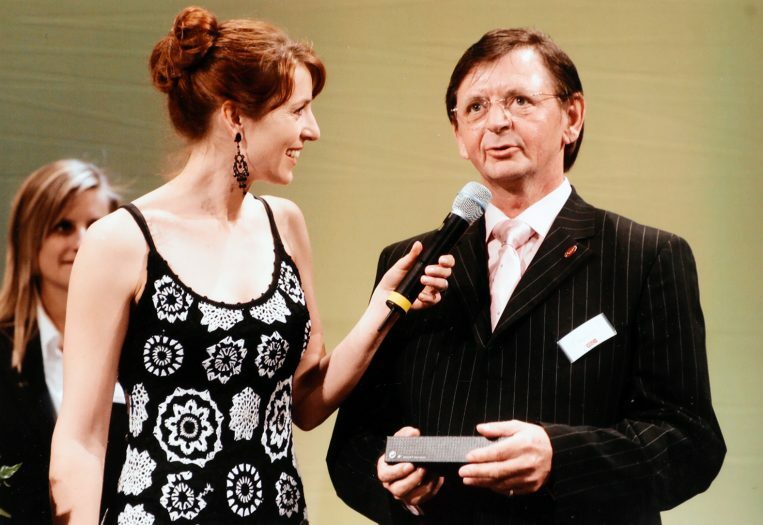 Thank-you speech: Georg Pelz receives his award as of the top 100 Opel sales consultants of 2005 from TV personality, Monika Lierhaus. The strategy – like PACE! – obviously works. 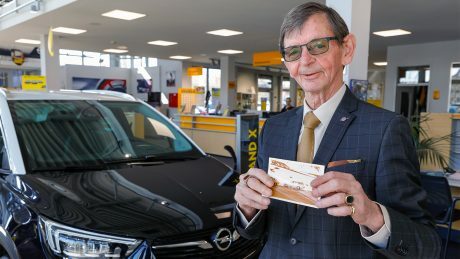 Customers have been known to travel thousands of kilometres across Europe to buy an Opel from “der Pelze-Schorsch”, as he is known locally. They also appreciate that they can reach him at all times, even in the evenings, just like it says on his business card: “Available any time” (except for a two-hour break for lunch and a nap at midday, which he never misses and is part of “concept for his success”). And with all his experience and “seniority”, when Opel brings out a new model or a new technology, he doesn’t go to every training session, either: “To me it’s almost painful what you hear there sometimes”, he chuckles. “Men like me are a dying breed anyway”, adds Pelz, who receives no salary and has always earned his living from the sales commission. To be successful in future, he believes the profession will need to do things differently. 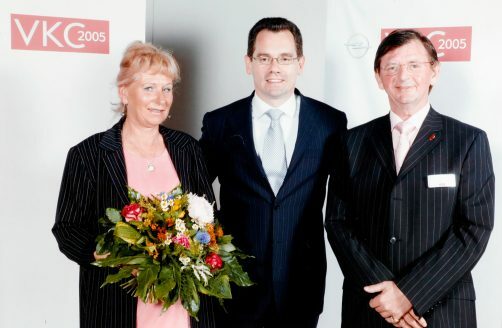 Celebration: The former Opel sales and marketing boss, Jean-Marc Gales (centre) with Renate and Georg Pelz at the 2005-event in honour of Opel’s 100 best sales consultants. Documentary evidence: numerous certificates and photos of the veteran sales consultant decorate one of the pillars in the Auto Jacob showroom. “If I were 20 years younger, I would set myself up at a big supermarket and sell cars there. Nowadays you don’t need a showroom full of cars, what you need is a computer with a good configurator”, he says, pointing at the monitor on his desk. Or he would get a van, the new Zafira Life for example, and turn it into a mobile sales consultancy. He would show all the options on the computer screen, whole families would be part of the deal – grandma and grandpa included. “You always need to do something that the competition doesn’t”, he adds with a wink. Second home: Georg Pelz on the forecourt at Auto Jacob, where over the years he estimates he has sold more than 25,000 cars.